The small letters in the margins are the Notes and Cross References that were a trademark of the Geneva Translation. This sample shows how extensive these Notes were. In an attempt to be handy and useful to the common man, most editions of the Geneva Translation were printed on much smaller pages than other Bibles of the time. This made a convenient-sized volume, which added to its popularity. This page is 8 inches long and 6½ inches wide -- quite small by standards of the day. In the lower right corner of the page, note the words "21 And". This is the first word on the next page -- verse 21 which begins with the word "And". The idea was to help those that read the Scripture aloud; these extra couple words at the bottom of the page were to help smooth reading while turning the page. This practice was common in most books of the 16th and 17th Centuries. A large number of copies of this 1599 Edition were purchased by the English Puritans, who, 20 years later, came to America as our Pilgrim Fathers in the Mayflower. 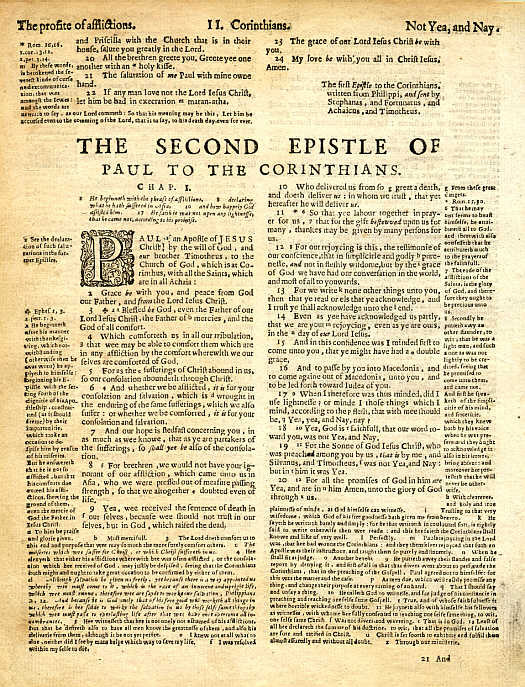 This means that the first English Bible in the New World was the Geneva Translation. Use the Menu on the left to view a closeup of another page from the Geneva Translation.